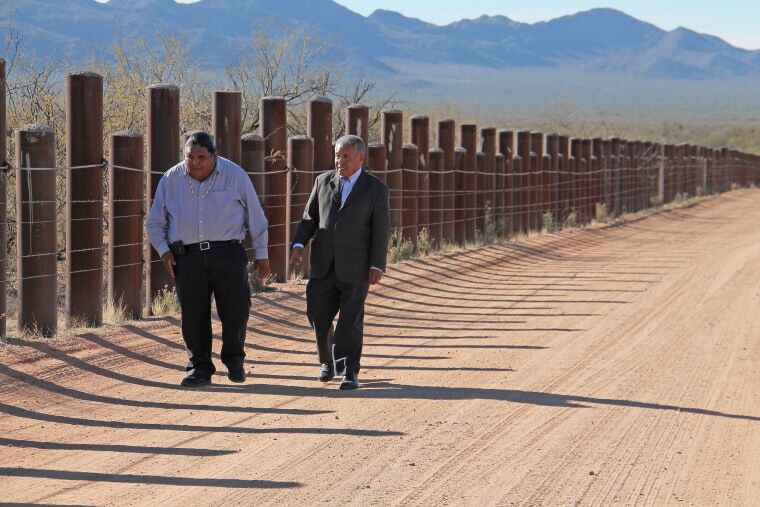 Tohono O’odham Nation Chairman Edward Manuel is determined to prevent President Trump's proposed border wall from carving a path through his tribe's lands — a move which he said would separate members from much needed resources and disrupt the community’s way of life. The nation, which is about the size of Connecticut, is a federally recognized tribe that has land and members on both sides of the U.S.-Mexican border. The Tohono O’odham Nation is just one of many groups that have expressed concerns about the potential path of the president's proposed $1.6 billion border wall. The National Congress of American Indians is also calling on the U.S. government to work with tribes on the border to address their concerns about the impact on communities. Much of the nearly 2,000 mile border is owned by private citizens. The government may gain rights to the land via “eminent domain laws.” These laws would allow the land to be bought out from under the owners, some of whom have already begun receiving notices. The Tohono O’odham Nation’s unique relationship with the border is a direct result of the Gadsdsen Purchase in 1854 in which the U.S. purchased land from Mexico. The sale rearranged borders, and “dissected our aboriginal lands,” according to a video from the tribe. The Mexican side of the border is home to a Tohono O’odham Nation burial ground and the site of many cultural and religious traditions, tribe members said. It also houses resources for members like Jacob Serapo, whose water supply is just a few yards out on the Mexican side of the border. In a video posted by the tribe, Serapo explained how he now has to travel four miles to access an alternative water source on the U.S. side to accommodate new border security features. A physical wall would also block the flow of water during monsoon season and potentially threaten agriculture, tribe members said. “These are our homelands and we want to protect it...We believe that what is effective is continued cooperation and working together,” Manuel said. U.S. Customs and Border Protection, which has two law enforcement centers on the tribe's land, told NBC News in a statement that the working relationship with community leadership has proved effective in the past. The “U.S. Border Patrol’s Tucson Sector, in addition to Intergovernmental Public Liaison Office, frequently communicates with the Tohono O'odham Nation to discuss issues and concerns and to maintain cooperation links that have existed for many years,” said Carlos Diaz, an agency spokesperson. Border Patrol and the tribe have worked together to seize “over an average of 313,000 lbs of illegal drugs per year,” according to the community’s video. There has also been an 84 percent decrease in migrants arrested on tribal land dropping from 85,000 in 2003 to 14,000 in 2016, according to figures from the Tohono O'odham Department of Public Safety. The land is also home to a tribal led high intensity drug trafficking area unit known as "NATIVE", the Native American Targeted Investigations of Violent Enterprises. The initiative is a partnership with the Immigration and Customs Enforcement, the FBI and Border Patrol. Currently, the nation is working with Border Patrol to add 15 surveillance and sensor towers for added security, tribal officials said. The Tohono O’odham Nation spends approximately $3 million dollars annually on border security and enforcement, tribal officials said. And it's because of this cooperation with the U.S. government that Manuel said he felt caught off guard by the border wall proposal. “We were never consulted and having 62 miles of international boundary we were never notified,” he said, adding that he found out about the wall from news reports back in January when the president signed off on it. Despite Trump's call for the “immediate construction of a border wall," his plans have been delayed due to lack of funding and landownership issues. The rally was held just a one hour drive away from the Tohono O’odham Nation. Dawchelle Hamilton is a desk assistant in NBC News' Washington bureau. She previously interned at NBC News, was a producer/anchor for NewsVision (a campus news show) and a student production manager at Spotlight Network (a WHUT TV affiliate). She is a graduate of Howard University.